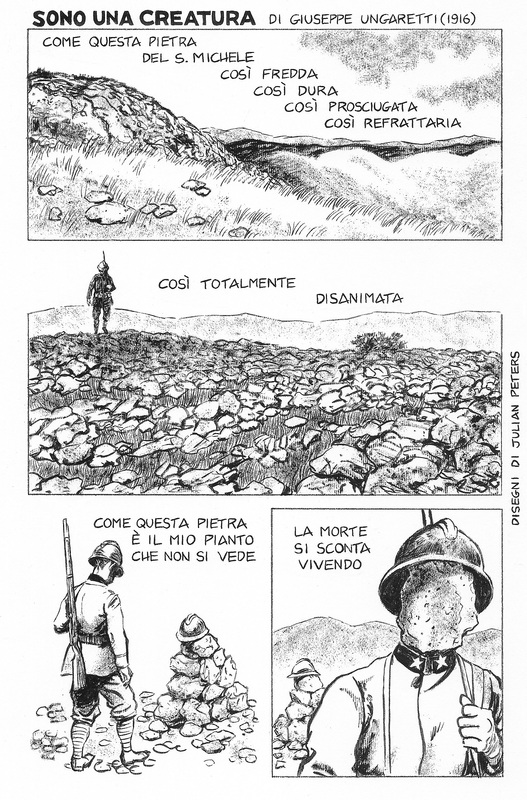 This entry was posted in comics, Giuseppe Ungaretti, illustration, marco sonzogni, Poetry, Poetry Comics, Poetry translation, ross woods, victoria university wellington, World War One and tagged carso, Dr. Ross Woods, fumetti, giuseppe ungaretti, i am a creature, san michele, sono una creatura, Victoria University of Wellington. Bookmark the permalink. Wow, that’s great. I can’t even read Italian, but it seems like I can thanks to your illustration! Grazie, John. Perhaps comics are the international language of poetry!